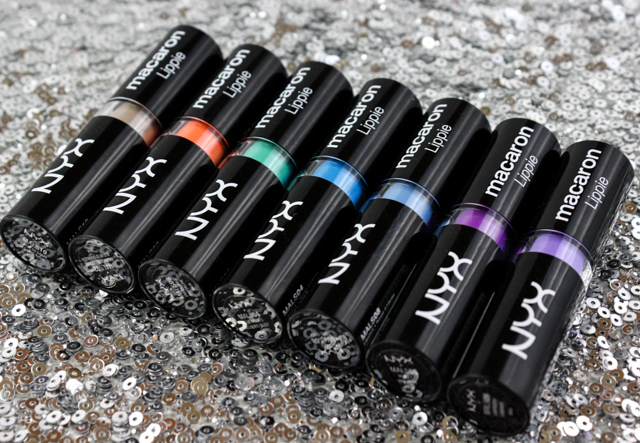 When I saw that NYX came out with their super colorful Macaron Lippies, I couldn't wait to get my hands on them! I have to admit, most of the colors are a little out of my comfort zone; but since I have been craving to play up my lips with over-the-top bold colors, these Macaron Lippies were just what I had in mind to experiment with. I hauled seven of the colors that stood out to me most. 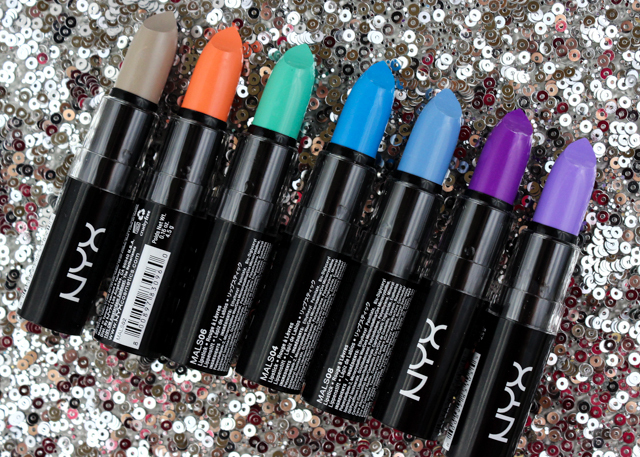 To be honest, I wasn't sure how I was going to feel about these bolder lip colors from NYX. It wasn't that long ago when I began to slowly explore other lip color offerings, beyond my usual go-to neutrals, reds, corals, and pinks. MAC's Heroine lipstick was one of my first introductions to purple lip colors (review coming soon), and Maybelline's Color Sensational® Vivids lipstick in Electric Orange made me realize that orange is much easier to get away with than I thought. Although the majority of the colors in NYX's Macaron Lippie lineup are a bit daring and out there, there are also wearable hues like a pretty pink, available. These lipsticks are super creamy and smooth. They glide on the lips without tugging, and they feel comfortable on. The pigmentation on these is nice, so I don't have to put much effort into building up the color. I was worried that these lipsticks would go on super patchy, being that they are so creamy and slippery, but I had no issues whatsoever. They each imparted pretty even results for the most part. 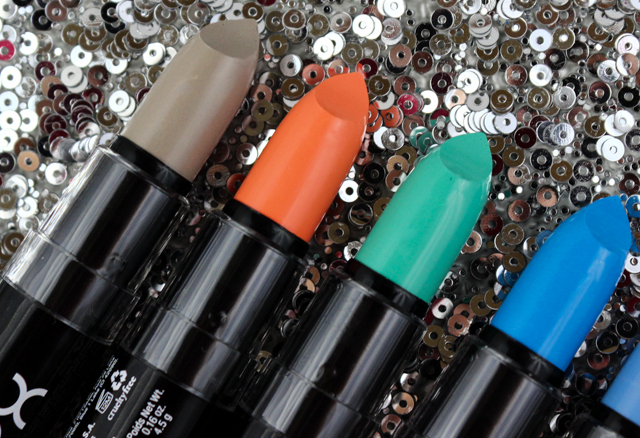 These lipsticks do have a sweet, artificial fragrance to them. I am not the biggest fan of the scent, but at the same time it's not overwhelming either. The lasting power on these isn't anything to write home about. I get around 3 hours of wear time before a retouch is needed. Violet on the other hand, does leaves behind a stain. NYX's Macaron Lippies really surprised me. In a good way. The formula of the lipsticks wasn't so bad, the pigmentation didn't disappoint, and the affordable price point can't be beat. I found these lip colors to be quite easy to wear and dare I say, even a little flattering on? I would totally sport these out sometime. My favorites would have to be Orange Blossom, Blue Velvet, Earl Grey, Violet, and Lavender. Love them! If you are itching to play with colorful lip hues that take bold to a whole new level, definitely give NYX's Macaron Lippies a try. What do you all think of NYX's Macaron Lippies? 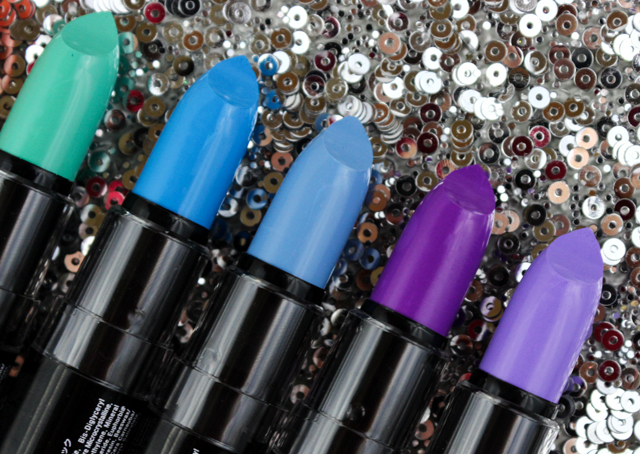 Would you sport colorful lip colors like these? These are seriously all so beautiful. I still need to get them in my collection. I love every single one! 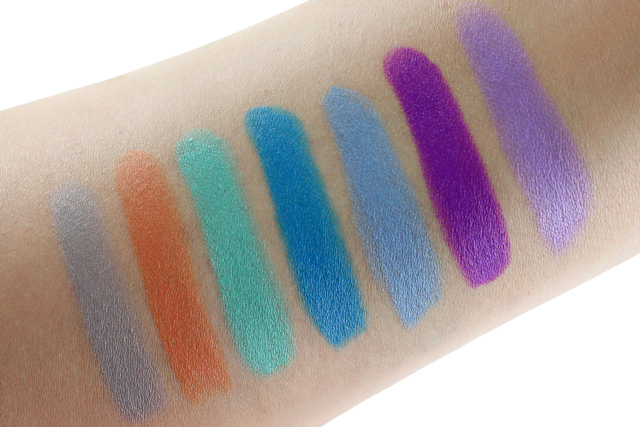 I think orange blossom and violet are my faves on you! I Totally support these coming out but I wont be picking up any! I'm not daring enough to rock these shades on the lips! These all look amazing on you! Omg, I love your selection. I wasn't brave enough to do orange but I just ordered mine last week. I am glad you enjoyed this post, Chelsea! Thank you! Thank you, Karo! Thinking of giving any of these a try?